What is GOJEK BETA Programme? The BETA Programme is a testing period for GOJEK. We will be evaluating the user experience and everything else related to the app – your feedback will help us optimise operations as we prepare for public launch. If you have previously registered with GOJEK, there is no need to register again. Simply put in your access code and you’re ready to GOJEK! Should you wish to change your phone number, simply log on and click the icon on the top left of your home screen. From there, go to My Account > Edit Profile > Change Phone Number. How will I know when I can use the GOJEK app? You will receive an email and/or push notification once we’re ready for you. Does GOJEK give out discounts for trips? Yes, we do! Stay tuned for occasional discounts in the form of vouchers and promo codes. To see if there are any vouchers you can use, simply click on the button on the top left on your home screen, then select My Vouchers. How do I apply vouchers on my trip requests? Not to worry – applicable vouchers will be auto-applied as you request for a trip. The voucher with the earliest expiry will be used first. You may choose to use a different voucher for your trip. All you need to do is go to My Vouchers, select the voucher you wish to use, and click “USE NOW” before booking your trip. Will the vouchers be applied to the total fare? Vouchers and discounts are only applicable to your fare amount – tolls and other charges will have to be paid in full. Where do I see my vouchers/discounts? To see the vouchers that you have, click on the small icon on the top-left corner of your home screen, and then tap on ‘My Vouchers’. How do I provide feedback or report a bug or issue encountered? To report a bug, request for a feature, or simply want to tell us how you feel, go to Help > Feedback under the button on the top left of your home screen. GOCAR is a service that matches riders with the nearest available private-hire vehicle – all the vehicles and driver-partners on our platform are commercially licensed. Does GOCAR currently offer trips for families with children? Not yet – we’re working on it! Our drivers may not be equipped with the proper child car seat – please look for alternative transport options in the meantime. Can I bring pets on GOCAR trips? We currently do not have a separate option for riders travelling with pets. However, if you’re travelling with a pet, just let your driver-partner know via the in-app chat once your request has been accepted. If the driver-partner cancels, we’ll automatically match you to the next nearest vehicle. Is there a carpool service? Not at the moment. Currently, only GOCAR is available in Singapore. We are working hard to bring you more of the GOJEK services – keep your eyes peeled! Can I make a multiple-stop booking with GOJEK? At the moment, only singular trips are allowed with GOJEK. If you change your mind, you can make one edit on your destination, and only after pick-up. Your fares will be automatically adjusted based on distance. If your new destination is closer than your original drop-off point, your fare will remain unchanged. How much is a GOCAR trip? Dynamic pricing may apply for specific hours and areas. Be sure to check the app for a price estimate when you’re ready to request for a trip! Dynamic pricing helps assure both supply and demand are balanced – this means better waiting times for both you and our drivers, and affordable rides when and where you need them. You may see slightly higher prices during times of high demand – a little thermometer will appear on your screen –, but we’ll make sure your rides remain competitively priced! Are ERP charges included in the fares? The fare does not include ERP charges. At the end of your trip, your driver-partner will enter the ERP charges incurred into the app before completing the trip. If you believe this amount was incorrectly charged, please contact us via in-app help. All you need to do is click the button on the top left on your home screen, select Help and the appropriate options within. We will review the fare and make adjustments if necessary. Any voucher that your trip request is eligible for will automatically be applied. If you prefer to use a different voucher or promo code, you must enter it before requesting a trip. The value of any voucher or promo code is applicable only for one trip – any remaining value disappears and will not apply to any following trips. Your promo code or voucher may not have been applied because of its expiry. 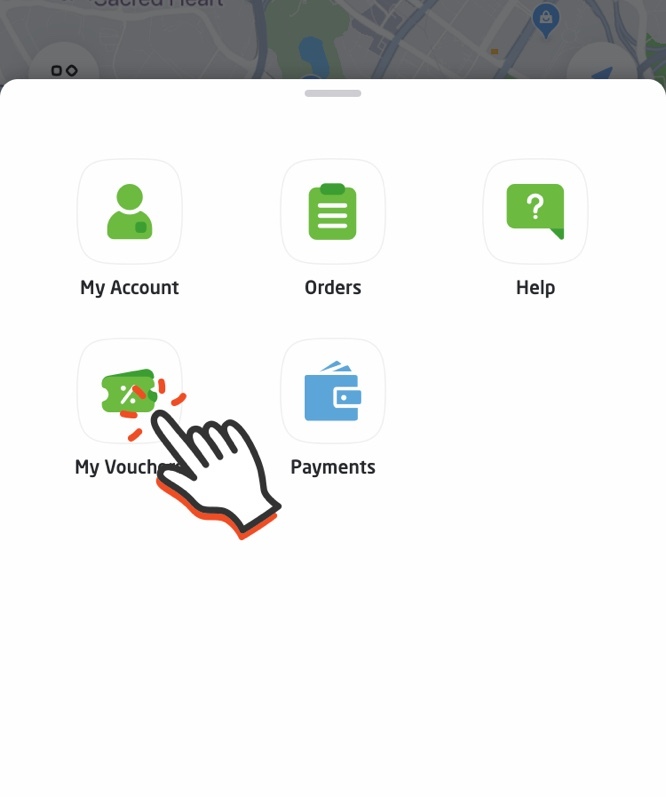 To view the full terms and conditions for your vouchers, visit My Vouchers under the button on the top left of your home screen. Please contact us via in-app help, and we’d be glad to make any necessary adjustments to your fare. Tipping at the moment cannot be done through the app, but feel free to use cash! Credit or vouchers cannot be used to tip driver-partners. Once verified, you’re ready to ride with us! Can I share my GOJEK account with others? No, each GOJEK account is unique to the phone number and email address registered. Every user on GOJEK must have their own account. Why can’t I log into my GOJEK account on my phone? Please call Customer Care at +65 3135 3135 for further instructions. If you are currently logged in to your account, you can click on the icon on the top left of your home page and go to My Account → Edit Profile → Change Phone Number or Email. We’re sad to see you go! If you wish to deactivate your account, please contact us via in-app help, and we will assist you with the process. What payment methods are accepted on GOJEK? We currently accept most VISA and Mastercard credit/debit cards, as well as cash. We are working on allowing other credit cards soon. Make sure that you’ve opted for your preferred payment method before requesting for a trip! How do I pay for a cash trip? Upon the completion of your trip, the final fare – including tolls and additional charges – will be shown in the app. Simply confirm this amount with your driver and pay him/her the amount in cash. My credit card cannot be added! Please ensure your card is a VISA or Mastercard credit/debit card, and that the CVV entered is correct. We're in the midst of making sure our app accepts other cards – stay tuned! Yes, you can reach GOJEK’s 24/7 Customer Care at +65 3135 3135. Help! I’ve left something behind. Please contact Customer Care at +65 3135 3135 and we will assist in retrieving your lost item. While we will do our best to search for it, neither GOJEK nor our driver-partners are responsible for any loss or damage to any item left in the vehicle, nor its immediate return. If there has been discrepancies between the details shown on your app and the vehicle that is picking you up, please let us know via the in-app help function. If you have been involved in an accident, please let us know immediately via in-app help or call us at +65 3135 3135. Please provide us your order number, along with other details of the accident. Is there Personal Accident Insurance Coverage on GOJEK? Yes, you will be covered as part of the driver-partner’s commercial insurance while you’re on the trip – from the time of your request to your drop-off. At GOJEK, we’re dedicated to creating an enjoyable and safe environment for everyone on our platform – and we can’t do this without your help! These community guidelines serve as a standard for how users – both customers and driver-partners – within the GOJEK community can ensure a pleasant experience for everyone sharing a ride on the roads. As a general rule, treat each other the same way you’d like to be treated. That means being on time for your trips, keeping your spaces clean, cleaning up after yourself, and embracing differences – GOJEK users come from all backgrounds! Safety is of the utmost importance in GOJEK, which means users must follow road laws at all times. Don’t go faster than the speed limit or ask drivers to do so, and make sure that all distractions are minimised when the vehicle is on the move. Don’t forget to keep pickups and drop-offs in areas that are permitted. GOJEK follows a 1 - to 5-star rating approach, with 5 being the best. Both customers and drivers are invited to send their ratings and feedback after every order. We’d love for everyone to be honest with how they feel – this helps us improve our services for the entire GOJEK community! Users can lose access to their GOJEK accounts if they don’t follow these community guidelines. Actions that can be deemed as harassment – such as unwanted physical contact and making improper remarks – as well as discrimination of any kind go against GOJEK’s mission to spread positive social impact through technology. Drivers on GOJEK rely on ride requests for earnings. Be sure to request for a ride only when you’re ready – and cancel only if absolutely necessary. GOJEK currently operates with a fleet of just 4-seater cars. Please request for more rides with other customer accounts if you have more than 4 passengers! Bringing your children out? They’d need a booster seat if they’re below 1.35m in height. Not all our cars are equipped with this, so please make sure to let your driver know. Choose easy, identifiable places for drivers to get to you. Some places are off limits, like bus stops. Keep an eye out for toll charges – this will be added to your total fare at the end of your trip. Accounts associated with fraudulent activity or misuse of the GOJEK app may be deactivated. These activities include abusing promotions and creating of duplicate accounts.